Nursing Department students in the class of 2014 received their nursing pin at a pre-commencement ceremony May 9 on campus. The pinning ceremony recognizes the graduating seniors’ successful completion of a rigorous academic and professional program. Pictured, first row, left to right: Carly Moriarty, Adrienn Myers, Nicole Marion, Shelby Giese, Mariah Mitchell, Alicia Kimberlin, Danielle Burgess, Hannah Tangen, Gabriella Epstein and Emilie Locke. 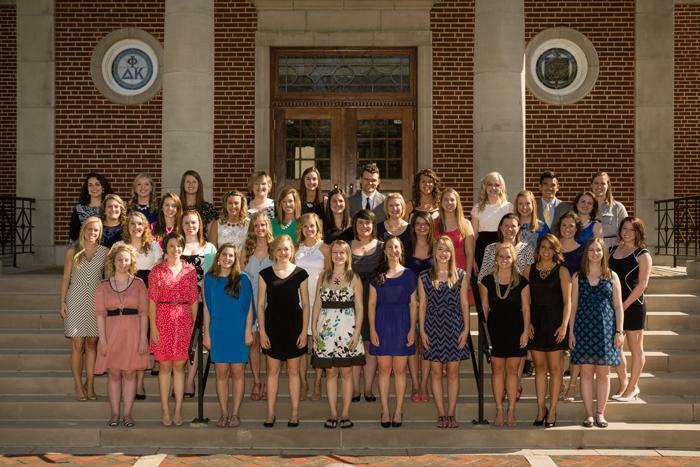 Second row, left to right: Kayla Ridenhour, Stephanie Lepper, Abigail Howe, Elizabeth Turnure, Andrea Grojean, Taran Burgess, Nicole Miller, Kalina Brinning, Brittany Thompson and Katherine Carlton. Third row, left to right: Mallory Eubank, Meghan Krepel, Maggie Scharnhorst, Josie Collett, Nicolette Jerowski, Ashleigh Hampton, Allison Daraban, Natalie Linneman and McCall Oliver. Fourth row, left to right: Eva Copeland, Erin Bavery, Jessica Ray, Shelby Leppin, Allison Faron, Zachary Esperanza, Jessica Curl, Bailey Ross, Sonny Phan and Megan Greving. The Truman Digital Library now includes additional volumes for the Echo yearbook digital collection. Currently, the years 1901-1980 are available online. Library staff members are working to cover 1980-2007 in the near future. To view the digital versions of the Echo yearbook, click here. The Echo Yearbook Collection incorporates innovative technologies to bring the viewer an enhanced experience, including full-text search, zoom and FlexPaper. FlexPaper technology has been integrated into the digital library experience to give the viewer the ability to virtually turn each page of the Echo yearbook. To view the general digital library or the Echo Yearbook Collection, visit digitallibrary.truman.edu. A total of 208 Truman student-athletes earned Academic All-GLVC honors for the 2013-14 season, ranking second-highest amongst all 16 Great Lakes Valley Conference schools. More than 2,300 representatives from the league’s 20 sports met the Academic All-Conference criteria. Not counting the three honorees from former football associate member Kentucky Wesleyan College, the 2,315 honorees from full-time GLVC members averaged out to 145 selections per school, breaking last season’s record average of 124. In addition, a conference-record 13 institutions had more than 100 Academic All-GLVC selections, an improvement from last year’s previous best of 12. Only Truman and the University of Indianapolis surpassed the 200 mark. The Academic All-GLVC honor is bestowed upon student-athletes that have completed two semesters at their institution and maintained a 3.30 cumulative grade-point average or have attained a 3.40 GPA over the two most recent semesters. The GLVC official total counts participants from each of the league’s 20 sponsored sports, meaning 19 of Truman’s 20 (wrestling excluded) counted towards the program’s 208 total. With wrestling added, the Bulldogs reached 216 overall. Last season, the Bulldogs placed 252 student-athletes on the MIAA’s Academic Honor Roll; however, the MIAA required a cumulative grade-point average of 3.00, compared to the 3.30/3.40 minimum mark set by the GLVC. Of Truman’s 474 total student-athletes (students count each time for each sport played), nearly 45 percent were named Academic All-GLVC. A total of 114 student-athletes from the conference’s 16 schools recorded a perfect 4.0 GPA during the 2013-14 academic year, including 16 from Truman. The league average was a shade more than seven per school. In addition, throughout the season, Truman added to its NCAA Div. II-leading CoSIDA/Capital One Academic All-America total, with the program now sitting at 107 after two spring sport additions. The Bulldogs entered the 2013-14 year ranked 25th amongst all four-year NCAA schools across all three divisions. The complete list of 2013-14 Academic All-GLVC honorees from all schools can be found online at GLVCsports.com, while Truman’s full listing can be seen here. Middle school students interested in health careers and science can get hands-on experience during the Adair County MASH Camp on July 15-16. Each summer the Northeast Missouri Area Health Education Center (NEMO AHEC) presents a MASH (Missouri AHEC Science & Health) Camp for area middle school students. The MASH Camp provides hands-on experiences to students interested in health care and science occupations, and exposes them to a variety of careers in the science and health fields. MASH Camp will take place from 8 a.m.-4 p.m. July 15-16 at Truman State University and the Northeast Regional Medical Center. Area health care providers and educators will combine their talents to present an impressive instructional program that will introduce students to the fascinating world of science and health care. Students will participate in biology labs, scrub labs, suture labs, hospital exploration, recreational activities and more. Any student who will enter sixth, seventh or eighth grade in the fall is eligible to attend. Enrollment is limited to the first 24 applicants. Registration requires a $40 fee for meals, activities and t-shirt. A limited number of scholarships are available to families in need. For more information call NEMO AHEC at 877.303.2938 or email mashintern@nemoahec.org. MASH Camp is sponsored by A.T. Still University, Truman State University, Northeast Regional Medical Center, and the Missouri Area Health Education Centers. Truman’s Nursing Advisory Council met at the Department of Nursing on campus during the spring semester. The council promotes the recognition, welfare and progress of nursing education at Truman through advising and consulting with the Department of Nursing. The department’s activities were highlighted by Stephanie Powelson, department chair, and included 177 students enrolled in the traditional Bachelor of Science in Nursing (BSN) program and 10 students enrolled in the first cohort of the accelerated BSN program. 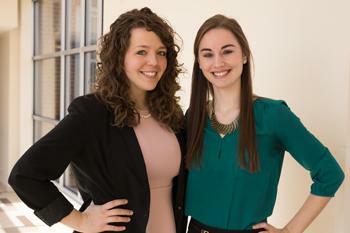 At this year’s event, two Truman nursing students, Jessica Curl and Allison Faron, shared information about several service-learning experiences at Truman. The council provided suggestions and feedback about admissions, clinical sites and service-learning experiences. Council representation includes 36 members from the community and 21 members from the University, and is led by Mark Laughlin, council chair, and Elsie Gaber, council vice-chair. The BSN program is accredited by the Commission on Collegiate Nursing Education and approved by the Missouri State Board of Nursing. 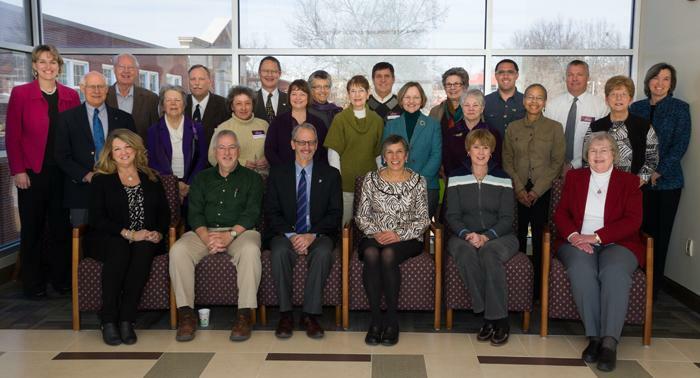 Nursing Advisory Council members pose for a picture during the annual meeting on the Truman campus. Pictured, front row, left to right: Sandra Novinger, Arthur Freeland, Troy Paino, Stephanie Powelson, Margaret Wilson and Odessa Ofstad. Middle row, left to right: Charles Baldwin, Harriet Beard, Brinda Geisbuhler, Brenda Higgins, Becky Osborn, Lori Haxton, Elsie Gaber, Bertha Thomas and Pat Murdock. Back row, left to right: Becky Pike, Jack Magruder, Jim LeBaron, Tim Tucker, Maria Di Stefano, Randy Hatcher, Janet Head, Justin Puckett, Christopher Halliday and Mary Laird. Not pictured: Martha Gragg, Andy Grimm, Lesa McCartney, Judi Misale, Shirley Riley, Alice Allinson, Cindy Carter, Rick Fleschner, Delores Lesseig, Myra Baiotto, Ranee Brayton, Dianthe Cable, Bonnie Collier, Mark Laughlin, Craig Phelps and Carol Race. presenters during the annual Nursing Advisory Council. The Great Lakes Valley Conference recognized eight Bulldog teams after each accumulated better than a 3.30 squad grade-point average throughout the 2013-14 academic year. The Bulldog women’s tennis (3.49), women’s cross country (3.47), men’s tennis (3.43), women’s golf (3.38), women’s swimming (3.36), women’s track & field (3.35), women’s soccer (3.34) and volleyball (3.34) squads each earned the GLVC’s top team academic honor for their work in the classroom last season. A total of 108 teams from the league’s 16 member institutions reached or surpassed the 3.30 minimum GPA requirement, placing Truman’s eight total above the league average. Of the 108, 87 women’s teams and 21 men’s squads were tabbed for the honor. Overall, Truman athletes accumulated a combined grade-point average of 3.16 for the 2013-14 academic year, with 17 of the department’s 20 teams posting a 3.00 GPA or higher. instructional programs is available here. Opportunities for local and regional high school students to participate in men’s soccer, women’s soccer or volleyball summer camps will be available from July 11-20 on campus. Women’s soccer head coach Mike Cannon will be hosting a three-day individual summer camp for all girls entering grades 9-12, beginning July 11 and running until July 13. For $200 ($180 if the participant is commuting), campers will participate in small-sided games, training with members of the Truman women’s and men’s coaching staffs, along with current and former players, as well as compete in both scrimmage and tournament competition. A total of six sessions will occur during the event. Information is available by visiting the Truman women’s soccer camp website. Head volleyball coach Ben Briney will be running a three-day individual camp for all girls entering grades 8-12 inside Pershing Arena, July 14-16. For $270 ($210 if the participant is commuting), players will get personalized instruction from Briney, assistant coach Megan Wargo-Kearney and current players. Information is available by visiting the Truman volleyball camp website. Men’s soccer head coach Duke Cochran will host a three-day individual summer camp for all boys entering grades 11 and 12, along with recent high school graduates. For $200 ($180 if the participant is commuting), campers will participate in small-sided games, training with members of the Truman men’s and women’s coaching staffs, along with current and former players, as well as compete in both scrimmage and tournament competition. A total of six sessions will occur during the event. Information is available by visiting the Truman men’s soccer camp website. The Truman men’s basketball team will conduct their Elite Camp from 11:30 a.m.-5 p.m. Aug. 2 in Pershing Arena. The camp is open to all boys entering 9 through 12 grades. Cost is $45 per camper, which includes a T-Shirt. For more information or to sign-up, visit TrumanStateBasketball.com or call assistant coach Chris Foster at 660.341.6182 or email at cfoster@truman.edu. For information on all of Truman’s summer camp options, visit TrumanBulldogs.com/SummerCamps14. IT Services now offers full-access to Lynda.com’s extensive training catalog. Two workstations will be available in the Pickler Memorial Library 204 Multimedia Lab. Lynda.com provides thousands of hours of interactive training on everything from MS Office products to 3-D animation, video production, eLearning tools and so much more. To learn more, visit training.truman.edu. Call the Public Relations Office at 660.785.4016 to sign up for a shift. Those who are interested in volunteering on other days may contact Frank Vorhees at fgv3685@truman.edu. The Student Recreation Center will close at 7 p.m. July 3 for the Independence Day holiday weekend. Regular summer hours will resume July 7. The next issue of the Truman Today will be available July 14. The Summer 2014 issue of the Truman Review alumni magazine is now available online at trumanreview.truman.edu. There will be a farewell reception for Beth Kral from 4-5 p.m. June 27 in the Student Union Building outside the Student Affairs Office. There will be a retirement reception for Charlotte Mathews from 2-4 p.m. June 30 in the Registrar’s Office. Cake and coffee will be served. The Department of Pubic Safety will conduct training for emergency response to an active shooter in Centennial Hall July 2. Any questions can be directed to Chad Whittom, assistant director of Public Safety, at 660.785.4176 or cwhittom@truman.edu. The Missouri Public Service Commission (PSC) will host a local public hearing on campus in which customers will have an opportunity to present comments to the PSC commissioners regarding a rate increase request from Liberty Utilities. The hearing will take place at 6 p.m. July 2 in the Student Union Building Activities Room.